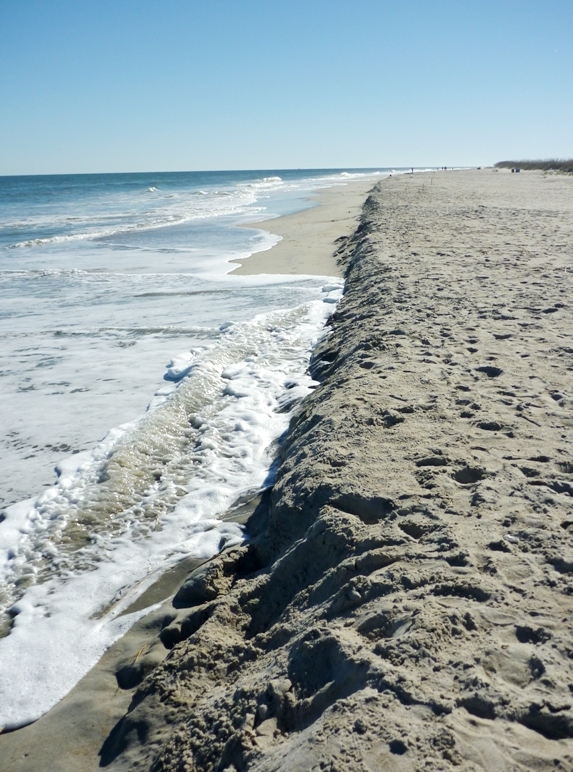 Scientists from the Skidaway Institute of Oceanography have introduced a powerful new tool to monitor coastal erosion to coastal planners and managers. The digital tool, AMBUR (Analyzing Moving Boundaries Using R), was developed to analyze shoreline change along barrier islands with complex shapes and highly curved shorelines. An analyst using AMBUR can take data from maps, aerial photographs or raw GPS data and use it to compute erosion and accretion rates in complex situations. AMBUR was developed by Chester Jackson as his doctoral project at the University of Georgia. Jackson is currently on the faculty of Georgia Southern University and is a partner in this series of workshops. David Bush of the University of West Georgia is also working with Alexander and Jackson. The three scientists introduced AMBUR to Georgia coastal managers and planners in a workshop in mid-November. Attendance included 8 GIS professionals representing Camden, Glynn, Chatham and McIntosh Counties, the City of Kingsland, the Sapelo Island National Estuarine Research Reserve and the Coastal Regional Council. 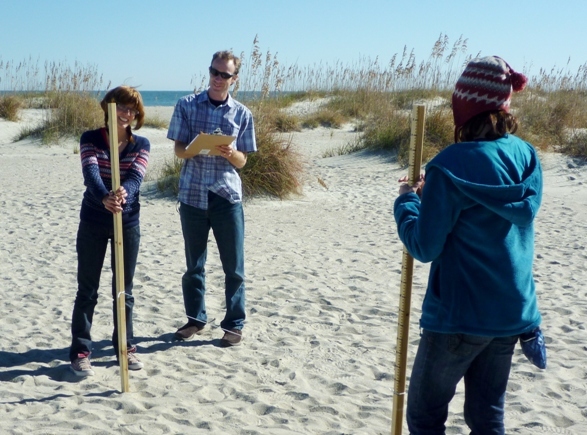 Workshop participants learn the art of beach profiling on Tybee Island beach. The AMBUR project is funded by a Coastal Hazards grant from the Georgia Sea Grant Program. Georgia’s Department of Natural Resources, Coastal Resources Division also partnered on the project. 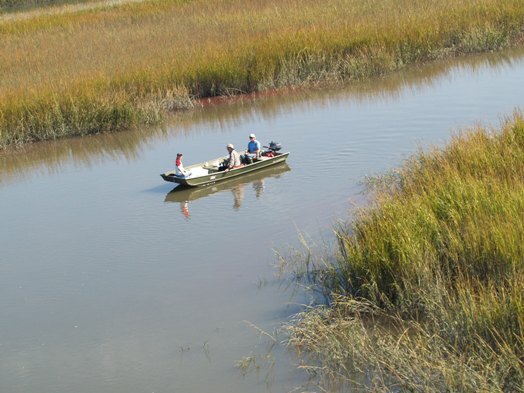 The Skidaway Institute campus was busy earlier this week, as researchers began a month-long field study in the Grove Creek salt marsh adjacent to our campus. 1.) 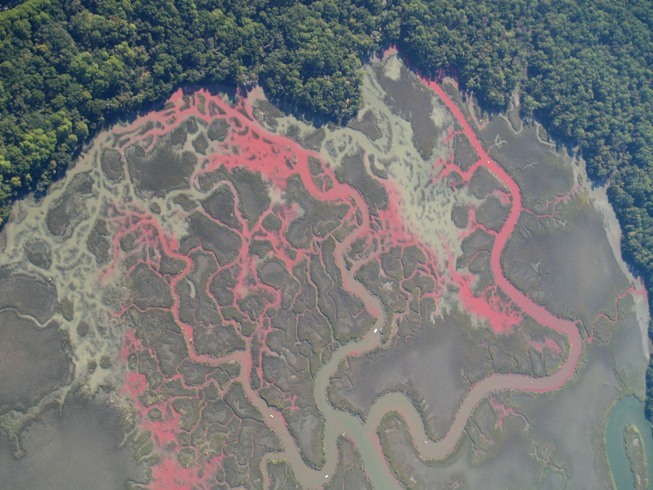 To test a model for predicting how salt marshes absorb and discharge contaminants. 2.) 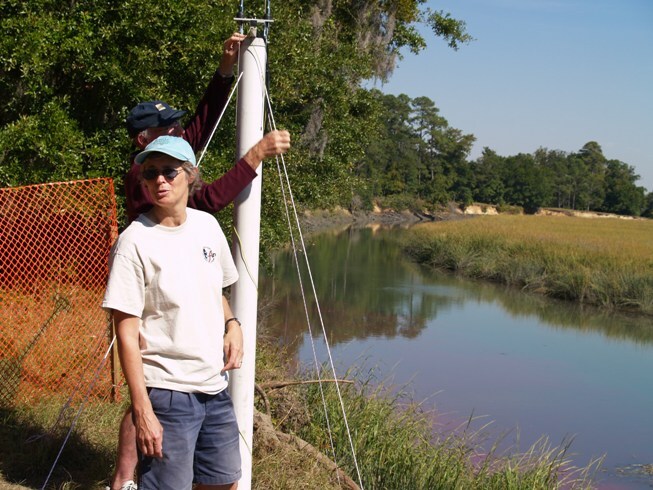 To test a new low-power, high-frequency radar system that is designed to monitor water flow through a salt marsh. Dr. Dana Savidge next to one of her radar antennae. The start of the field work was visually impressive. 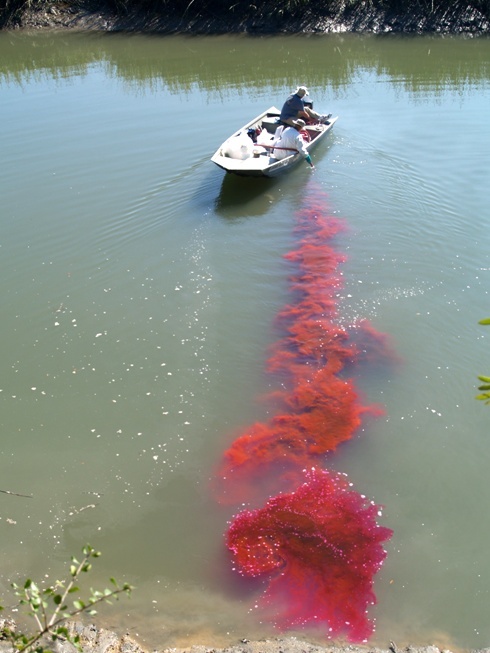 It began with the release of a concentrated red dye into Grove Creek. As the tide came in, the dye was pushed into the marsh. 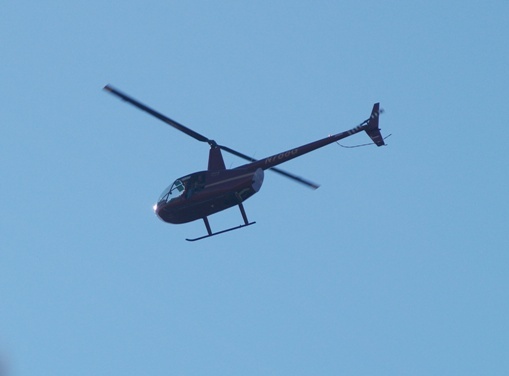 The research team used a helicopter, boats and sensors to observe the way the die was distributed. From 3,000 feet, it was easy to watch the way the die flowed through the tidal channels and into the intertidal zone. Grove Creek salt marsh from 3,000 ft. While this may have been the most visual part of the study, the most valuable scientific data will come over the next month. The marsh will absorb some of the die and release it on the outgoing tide a little at a time – like rinsing soap out of sponge. The scientists will observe this process and then compare it to their model to see how well their predictive model works.